Utobeer has been a regular feature of Borough Market, offering an truly enormous range of bottled beers for sale. Until recently the beers have only been for off premises consumption though. This changed in the Summer when the guys opened up a small bar, in the market, called The Rake. Apparently this is the first 'pub' on the market's grounds for hundreds of years. However, if you're simply wandering around the market casually you won't find it easily. It's actually away from the main area at the back of a car park. It's a tiny, physically separate building, claiming to be the smallest pub in London (13x7 feet for the bar area). It's probably a mistake to think of this as a pub. It has an undeniably pub-like name, preparing one for Hogarthian bawd. Actually I've just checked the meaning of 'bawd' and, no, I wasn't expecting that. It also has two real ales on draught, affirming its pub credentials. But look around you . . . where's the furry fabric induced, pub style cosiness? It's all steel cabling, glass and light coloured wood. And what are all these bottled beers? See . . . it's a bar. Bit of a hybrid then. The main room is absolutely tiny so they've extended the available space with a well styled beer garden - high fences, decking, umbrellas, more than enough chairs (there's a stack of these on the wall - a simple thing that most pubs and bars just don't get right). There are also outdoor heaters which should extend the usability of the garden into Winter. The beers are clearly the main draw here. 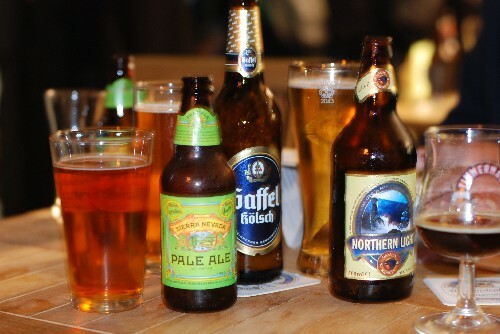 There are over 1200 bottled beers available from all over the world. American micro-brews nestle alongside African organics, continental lagers live in harmony with independent bottle-conditioned brews. As well as the real ales, there are several continental beers on draught: Veltins pilsner, Sierra Nevada pale ale (the, um North American continent, that is), Duchesse de Bourgogne by Verhaeghe, Kwak and Kriek. I started with the Duchesse, an extraordinary tasting beer - sweet and sour. I followed this with a bottle of Northern Light from the Orkney brewery. This place considerably boosted my spirits after the slightly disappointing trip to Roast. I recommend venturing beyond the delights of Stoney Street and progressing to the Rake. Isn't any beer that isn't made in England's green and pleasant land classed as Continental? In this case, the North American continent? Nah . . . it's just a mistake innit. I'll change it. were they serving any goose island from chicago? they sell it at uto. it probably doesn't qualify as an american micro anymore, but it's good stuff.